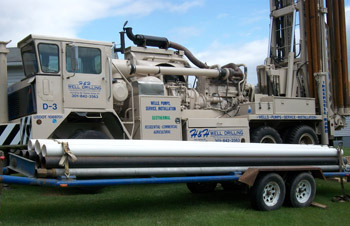 We are equipped with 3 drill rigs that are capable of drilling 6" up to 22" bore holes. Our 2000 gallon water tanker gives us the ability to haul water and also to remove excess mud and waste to keep any project site at clean working conditions. The boom-mounted crane truck gives us the ability to crane large equipment and any materials that are too heavy for the winch on the drill rigs. Mounted with water and fuel tanks to supply the drill rigs and welders and generators for working with casing or any other needs. These service trucks are equipped for whatever may happen on the construction site. This unit is equipped with the generator, control box and pump system necessary to pump test your well. This equipment is commonly used for proper cleanup of walkways and driveways or any finished surfaces in need of hot or cold high pressure cleaning. We are equipped with a large range of trailers in various weight classes that are designed to haul items up to and exceeding 10,000 lbs.